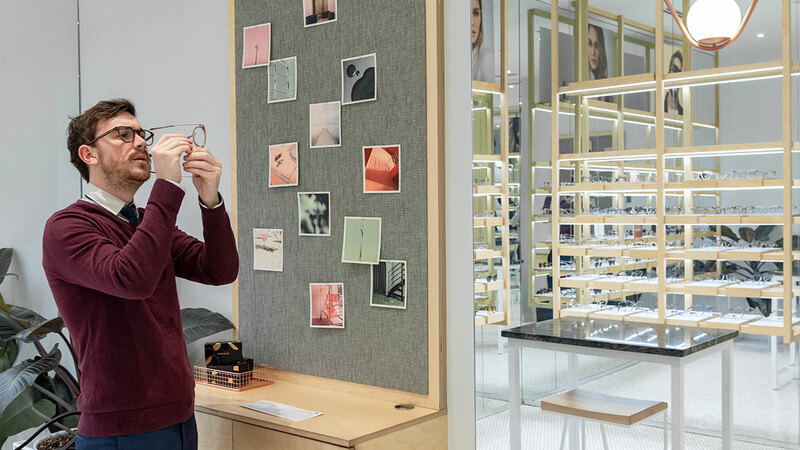 Bonlook’s in house optician, Guillaume Lecoq, demystifies the key elements of prescription lenses, helping you make an informed choice and get the perfect lenses on your next purchase. In order to determine the lens quality; the material used, the lens thickness and additional treatments such as anti-glare, must be taken into consideration. When thinning out a lens, it actually decreases the quality that may cause vision distortion and/or discomfort. This is the reason why I often mention that despite the aesthetics of thin lenses, it does not favour the quality and is not always necessary. Any additional treatments that can be applied to the lenses, always add quality and comfort. If you are regularly exposed to electronic devices, you should consider adding a Blue Light protection to your lenses. What is blue light? It is a wavelength at a certain intensity (like UVs, X-rays, etc.). Sources of blue light include the sun, electronic devices and fluorescent and LED lighting. Today, most digital screens like those of TVs, computers, tablets and smartphones emit high-energy blue light. Blue light is a colour in the visible light spectrum that can be seen by the human eye. It is divided into two types of frequency: blue-violet and blue-turquoise. - The blue-turquoise light is as needed by our body and our metabolism as vitamins, minerals and antioxidants because it helps regulate the natural sleep/wake cycles known as circadian cycles. - The blue-violet light increases visual fatigue due to extended use of digital devices and can damage the eyes in the long run. - The first “varnished” layer is commonly known as anti-scratch. This layer protects and prevents scratches and micro-scratches on the lens. Lens materials are easily scratched, hence why this layer is used in 99% of cases. - The anti-glare treatment is a surface coating that reduces stray reflections of light on the surface of the lens. This treatment is always associated with the anti-scratch treatment. - The polarized treatment is a filter applied on the surface of the lens to reduce glare caused by light reflection on bright surfaces (ideal for nautical activities, driving, etc.). - The photochromic treatment is used for its versatility and practicality when alternating between outside and inside activities, but also for monetary reasons as you get two pairs for the price of one. Depending on the supplier and the technology used, the lens darkens when exposed to UV rays or when the brightness increases. At BonLook, our sun lenses tint at the exposure of UV rays. It is important to choose your frame based on your face shape, but also according to your prescription, hence why you should always consult an eye care professional like the opticians who work at our BonLook locations. To best combine appearance and technicality, you should stay away from certain shapes or widths depending on your prescription. For example, if you have high astigmatism, you should avoid round frames as the lens could move into the frame and shift the axis on which the astigmatism is corrected, which would affect the quality of your vision. You should also consider your morphology (nose, cheeks, temple width, height of your eyebrows, etc.). If the base of your nose is flat, it will be more difficult to adjust your frame, so you should choose a frame with nose pads for better support. Sun protection is essential to protect and prevent premature aging of your eyes. Direct exposure to UV rays increases the risk of developing cataracts and can result in an age-related macular degeneration (AMD). Do not assume that because your sun lenses are very dark, it protects you from the sun. To do so, the lens must also filter UV rays, as the tint does not have a protective power. Certain materials, such as the ones we use at BonLook, already have the property to properly filter UV rays.